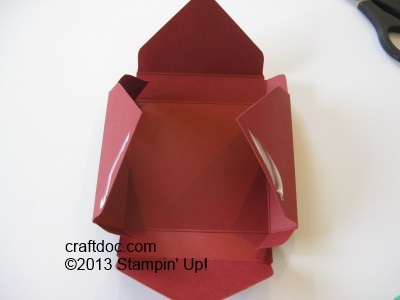 I’ve seen several of these card boxes (thanks Janet, Angie, Patty) and wanted to gather my measurements together to make any size box. 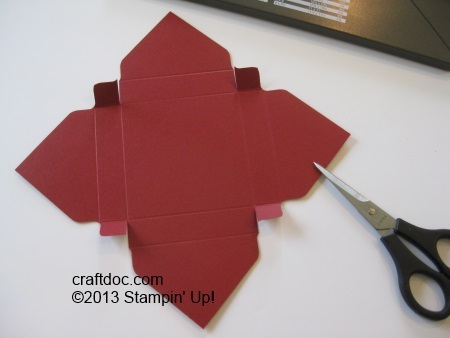 These are so quick and easy using the new envelope punch board by Stampin’ Up! 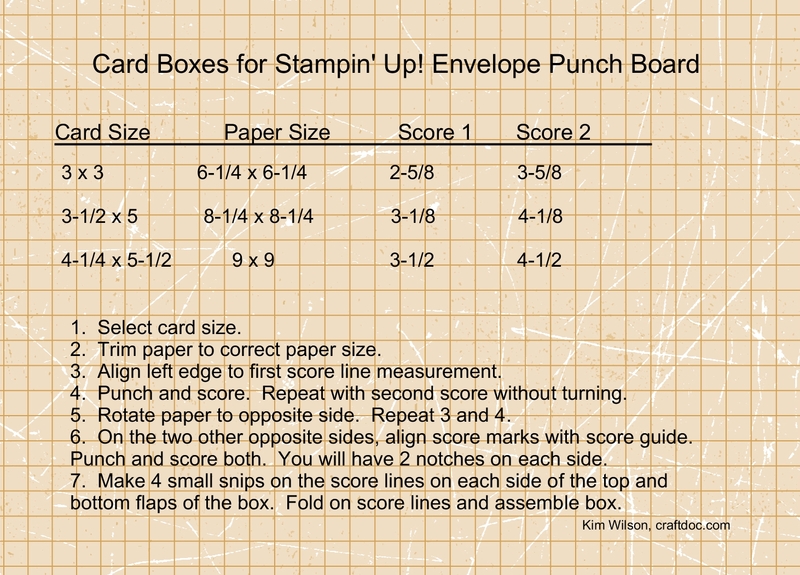 In the chart, I have posted the measurements for our commonly used card sizes. It looks like you can make any size box by looking on the chart on the board itself. 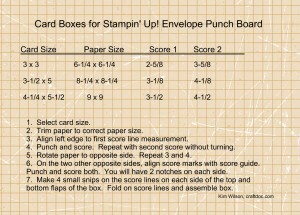 Add one inch to the paper size, use the same score size for the first score and add one inch to the second score size. Let me know if this chart is helpful. You can also cut the tabs off completely if you prefer. I was a little heavy on the liquid adhesive! 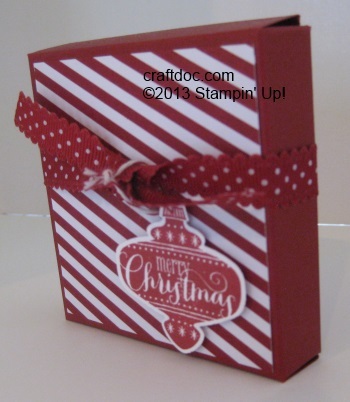 I used the Seasons of Style Designer Paper and Christmas Collectables Bundle to decorate my 3 x 3 box. I can’t wait to make some cards to match! 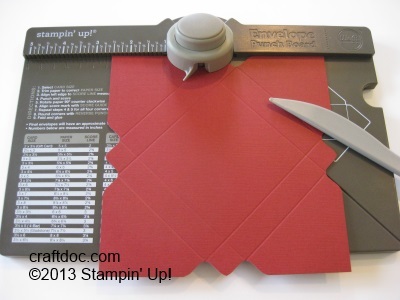 All supplies can be ordered at www.kwstamps.stampinup.net The Cherry Cobbler ribbon and cardstock are currently on the Clearance Rack for a great price! Added: here is another way of looking at the process. 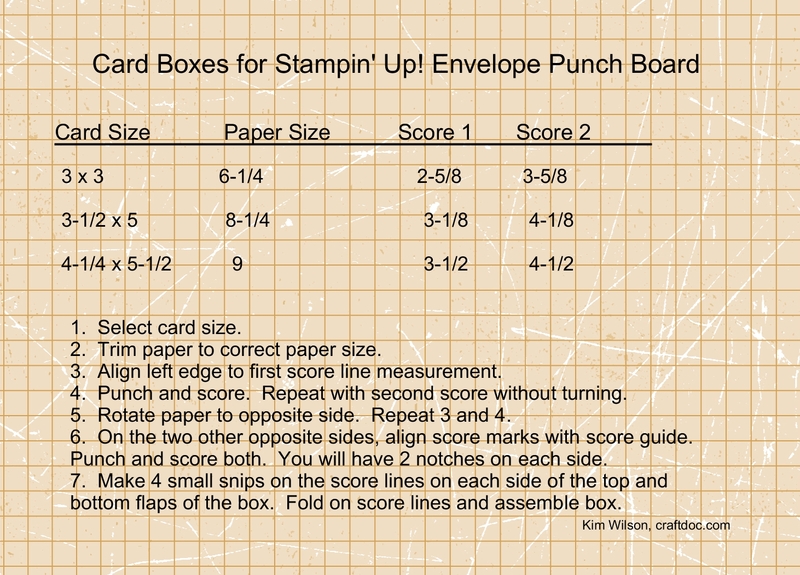 For envelopes, you only use the measurement once, then turn 90 degrees and use the score lines each time. For the boxes, you use the measurements twice on OPPOSITE ends. Then, on the other opposite ends, you use the score lines. For square boxes, it is the same (and doesn’t matter), but for rectangular boxes you need to do it the 2 different ways. This is great, thanks for sharing with us. What I time saver for all of us! Kim, this is awesome!! Thank you so much. I found a jpg of this chart on google images. This is so great. Had to check out the blog posting as Jean mentioned you give more information. So wonderful that you’ve share this with us. Thank you! Thanks so much for sharing! I was ready to tear my hair out making boxes for a craft fair. This saved my sanity. Thank you for this post, it gives me hope. I am in dire need for the dimensions of CS and score lines to make a box to hold five 3 x 3 1/2 note cards. I have been all over you tube and pinterest and after making boxes just to find out they were too big, I am desperate. Can you please help me or direct me?